Disney and Lucasfilm have announced the release dates for both the digital and Blu-ray/DVD releases of Star Wars: The Last Jedi. As is customary these days, the digital release, which will be available in HD, 4K Ultra HD and via the Movies Anywhere app is coming early on March 13. If you're looking for a physical copy, you're going to have to wait until March 27. Star Wars: The Last Jedi will be released on 4K Ultra HD Blu-ray, Blu-ray and DVD on that date. This also marks the first Disney title to ever receive a 4K Ultra HD Blu-ray release in both Dolby Vision HDR and Dolby Atmos immersive audio. The Last Jedi Blu-ray comes packed with quite a few special features. The Director and the Jedi is a deep look behind the scenes with writer/director Rian Johnson taking you through the production of the movie, allowing you to experience what it's like to helm a Star Wars movie. Balance of the Force will explore the mythology of the Force and why Rian Johnson chose to interpret its role in such a unique way. Lighting the Spark: Creating the Space Battle takes a close-up look at the epic space battle in The Last Jedi, looking at everything from the sounds to the practical and visual effects, as well as the characters. Snoke and Mirrors walks fans through the detailed process of creating the movie's malevolent master villain, looking at the motion capture process used by Andy Serkis to bring Snoke to life. Showdown on Crait is a break down of everything that went into creating the planet featured in the movie's final confrontation. Andy Serkis Live! (One Night Only) features Rian Johnson presenting two exclusive sequences from The Last Jedi featuring Andy Serkis' raw on-set performance before his digital makeover into Snoke. The physical release of Star Wars: The Last Jedi will also feature several scene breakdowns, but the scenes included have yet to be revealed. The release will also include 14 deleted scenes, but again, the scenes included haven't been announced. Though, they will include an introduction and optional commentary by Rian Johnson. And last, but certainly not least, The Last Jedi Blu-ray will include an audio commentary by Rian Johnson. Fans who purchased the first Blu-ray release of Star Wars: The Force Awakens will note that a J.J. Abrams commentary was absent, only to be released later. With the home video release officially set for March, that represents a slightly quicker turnaround for Star Wars: The Last Jedi, which was released in theaters on December 15. For the sake of comparison, Rogue One: A Star Wars Story was released on Blu-ray on April 4, 2017. Star Wars: The Force Awakens made its way to Blu-ray on April 5. Below, you can check out exclusive versions of the Blu-ray that will be available at various retailers. 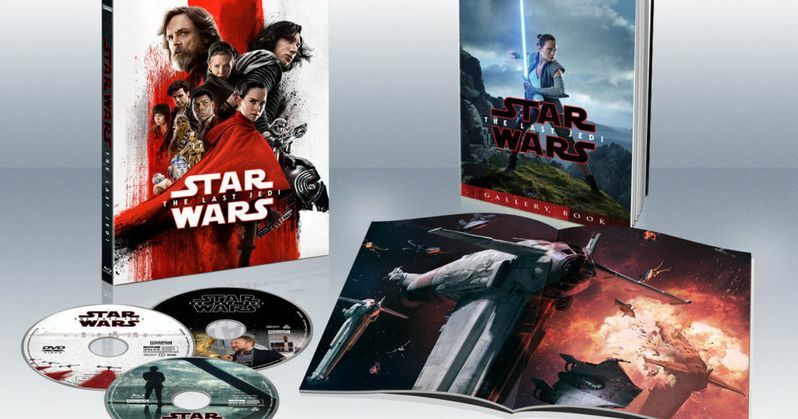 As of late, Best Buy has been getting steelbook versions, which holds true this time around, with Target getting their own exclusive packaging and an additional Meet the Porgs featurette. So depending on what you want, you'll have to decide which version to buy. You can check out the trailer for the home video release of Star Wars: The Last Jedi, perhaps the most divisive of the Star Wars movies, courtesy of the Star Wars YouTube channel, for yourself below.